We had a reader ask about drying avocados and guacamole. She had me stumped, not only had I not tried it, I couldn’t find anything on anyone else having done it online. So I figured…at most I would be out $4-5 to see if it could be done. So can it? YES!!!! To help with the preservation I did cheat a bit and used Concord Food’s guacamole mix that I found in the produce department. Due to avocado’s fat content a little salt in the dish is helpful. The only issue I had was that I bought 2 Hass avocados that are a bit smaller than the package of mix called for. Oh well! Next time I will know to either buy 3-4 Hass’s or 2 large of the other avocados. Cut your avocados in half down lengthwise. Take a chefs knife and whack it gently into the pit. Twist your knife and the pit will pop out. Meanwhile take a spoon and go under the lip of the peel all around. The avocado meat will pop out for you. Discard pit and peels. Put the avocado meat into a glass bowl and mash up with a potato masher or fork with the dry mix. 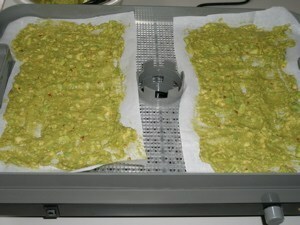 On parchment lined dehydrator trays take ¼ cup servings and spread each serving thin with a spatula on its own section of paper. I dried it 135* for 7 hours. At 4 hours in I flipped the parchment paper over so the other side would get heat. At 5 hours I came back and peeled the paper off. This allowed the back side to get free air movement. When dry I let it cool to room temperature then ran each section through my mini grinder to powder it. I then packed it into snack size bags and marked it. Each 1/4 cup of fresh became about 2 Tbsp dry mix. To rehydrate add 2 Tbsp cold water, seal bag and kneed gently. Let sit for 15-20 minutes. You may need to add a bit more water to your texture preference. 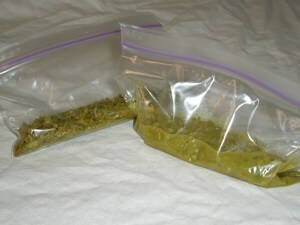 Dried mix on left, bag being rehydrated on right. Due to the natural fat you would want to store it in your freezer and use up in 3 months or so. I would not recommend carrying the dried guacamole for extended periods in hot weather due to said fat – it could go off. Otherwise it works great and tastes fabulous when done!